A copy of this book was sent to me by the author for an honest review. I have tried and failed many times to write a proper review for this novel. I'm going to simplify this a bit. 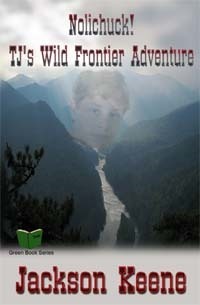 TJ’s just an ordinary fourteen year old kid with extraordinary problems at home and school: A broken up family from his parents’ bitter divorce, evil bullies almost every afternoon, failing grades, boring classes, snobby girls, mean teachers, cut from basketball tryouts, few friends. Life is rough for TJ Cockrell. And he thought his present life was bad news! But TJ’s adventures are only beginning. Along the way, he fights off killer beasts and bandits and braves, gains a world of confidence in himself, finds his first real love, and meets a fantastic frontier family who really has it together. When he returns to the present, he’s a brand new person––ready to defeat deadly robbers in his own home, beat the bullies at school, win the girl, gain friends, and make great grades. He even gets his family back together again. Sort of. In the end, the little green book is really cool. And TJ can’t wait to go on another action-packed adventure into the perilous past! I feel like this floats between two genre/age groups. TJ thinks like a character from a MG novel would, yet at the same time the violence and language as well as his relationship with his crush are more YA. A novel that bridges the slight gap between MG and YA would be great, but I feel like Nolichuck fell a bit short. I'm in my 20's and female, so some of my issue's with TJ may be unfounded, I can't relate to this teenage boy as well. I still felt like TJ was immature for his age. He DID grow as the novel progressed, I still felt frustrated with him. I'm being nit picky here, but some of the writing felt... odd. Let me see if I can describe it. It's as if someone were describing him, but he is thinking that himself. It felt like parts of the book were written in first person, and some parts in third. Time travel. I especially liked that it all took place in Tennessee. So many authors feel the need to make the story more exotic by placing it in a far away country. There is SO much history right here in the US, I enjoyed reading that. The rules. The way he travels in time, and the rules that apply, are unique and I liked them. I've read so many time travel books, and watched Doctor Who far too much, but you never want to mess with the past. Bad things can happen. In Nolichuck however, it works a bit differently. Overall, I wasn't thrilled with this book. The characters frustrated me, the narration was difficult to read... However, there were a few ideas I did like, and I think that if future books in this series expand on those, they will be interesting. Not sure this is my thing. Sounds like it could use some editing as well. ALSO, I would walk right past this one because of the cover. BUT the premise sounds intriguing at least. This brought my editor side. I wanted to go in and fix parts and design the cover. I think the best reviews are the "negative" reviews that are balanced enough that people who are coming from a direction might still be interested. I think you do an excellent job here. I do an occassional review, and I always take it as a complement when someone says they are interested in a novel that I say that I personally didn't like. Thank you! Usually I wouldn't post a review like this, but the author was quite insistent. A lot of what I wanted to say is stuff that should come from an editor or beta reader. So I really tried to be fair and honest. I want to design this cover. Wow. Haha! I was expecting that from you! You'd do an amazing job, too. Hehe. You're so nice. :) Thank you!